Due to the abundance of sunshine and warm weather that the Phoenix area experiences, swimming pools are a core element of many commercial properties around the Valley, including hotels and resorts, apartment complexes, and HOA-managed residential communities. Regardless of the type of property, selecting the right fencing to surround the pool area is crucial for the property’s appearance and the safety of guests or residents. Enhanced safety. Commercial pools experience a high volume of visitors, which often include many children. Therefore, keeping unauthorized entrants out of the pool area—and away from the threat of drowning—is an important step in avoiding accidents and minimizing the property owner’s risk of costly lawsuits. Due to its natural durability, wrought iron offers superior safety compared to other types of fencing materials. It is difficult to damage, making it resistant to being breached. In addition, wrought iron fences typically do not contain handholds or footholds that would enable someone to climb the fence and access the pool area without supervision. Aesthetic appeal. For centuries, wrought iron has been admired for its stately appearance—and today, it still adds an elegant flair to any property. While wrought iron in itself can serve as a centerpiece, most wrought iron fences have enough space between the pickets to allow swimmers and sunbathers to enjoy views of the surrounding property while lounging by the pool. Wrought iron offers the advantage of malleability, which means that it can be heated and formed into a variety of shapes and styles. At DCS Pool Barriers, our wrought iron pool fencing is available in a wide range of different colors and various styles, including sleek and contemporary, ornate, or decorative with themed motifs. We work closely with each customer to ensure that the finished product complements the look and feel of the surrounding property. Strong return on investment. Like any business owner, commercial property owners must always ensure that their investments will yield long-term value. Wrought iron’s inherent sturdiness enables it to last for several years—even when faced with a great deal of wear and tear and exposure to rain, wind, or strong sun. DCS Pool Barriers takes additional steps to ensure that our wrought iron pool fencing delivers a strong return on investment for our customers. For example, all of our products are made from premium-grade steel and carry the option of galvanization, which is the process of sealing the wrought iron with a zinc coating to protect against rust. Galvanized wrought iron products from DCS Pool Barriers come with a ten-year warranty. As the temperatures rise and peak swimming season approaches, now is a great time to ensure that your commercial property’s pool fencing is in sound condition. The team of professionals at DCS Pool Barriers is familiar with all state and local laws regarding pool fencing, and we will work with you to develop a pool barrier solution that is up to code and well-suited for your property. We design, manufacture, and install all of our products, which enables us to reduce costs and pass the savings on to our customers. 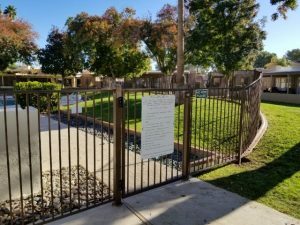 Contact us today at 623.825.7700 or online at https://dcspoolbarriers.com/contact-us/ to request a free estimate for your commercial pool fencing!